Before going too far, if you would like to take the short survey, here is the link to the survey we will discuss. Thanks in advance for filling it out! Why would someone want to use pandas to read a Google Sheet? The key functionality this setup provides is a simple way to allow a large number of people to provide you information (don’t just think of a standard survey) and collect it all in a single place. You can then analyze the data with the full power of python and pandas. Google takes care of making sure that all the data gets consistently entered into one clean format - no matter how many people access the form. This blog has mentioned many times about how Excel can be a great tool but is so often abused and made to do more than it really should. One use case I have seen is creating a simple Excel-based form which someone sends to people to fill out, then collate into a master spreadsheet. This process is extremely manual and error prone. 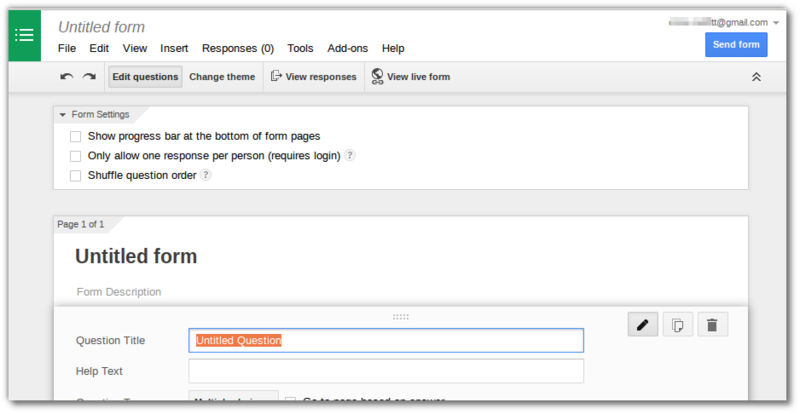 Google Forms is a possible alternative to the spreadsheet wrangling you might do with Excel. The other scenario is that sometimes you need a very simple UI to capture information and act on it. 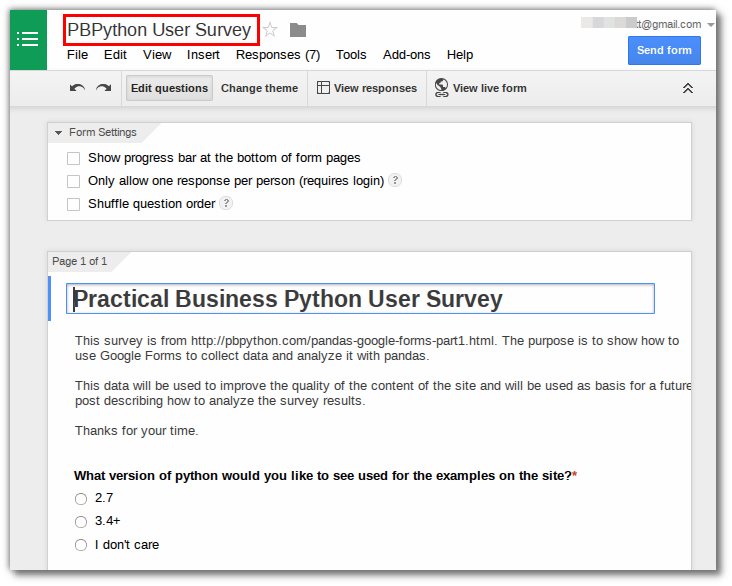 Once you start to play around with Google Forms you may realize that there are other uses for it outside of the standard survey process. The first part of the process is creating the Form. If you haven’t used Forms before, go to Google Forms to learn more about the service and what it can be used for. Go ahead and create a Form. It is all fairly intuitive. The main thing you need to pay attention to is the name of the form. 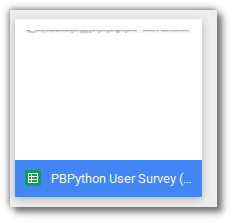 In this case - PBPython User Survey. When you are ready, you can publish the survey by clicking on the Send form button. Here is the link to the survey for this site. Now that you have the basic form set up, it is ready to store your data in a Google Sheet. The next step is setting up access so that your python script can connect to Google and download the data. I won’t go into the details of OAuth 2.0 but the basic summary is that it is an open standared that defines a protoccol for granting access to resources. The key here is that it is a protoccol so there are several steps in the process to get it set up. The other bad news is that everyone tends to implement things slightly differently so you need to understand each provider’s setup. The good news is that once it is setup, it should run without further intervention and it is more secure than the old username + password combo! The first step in getting authentication working is to enable our google drive API. 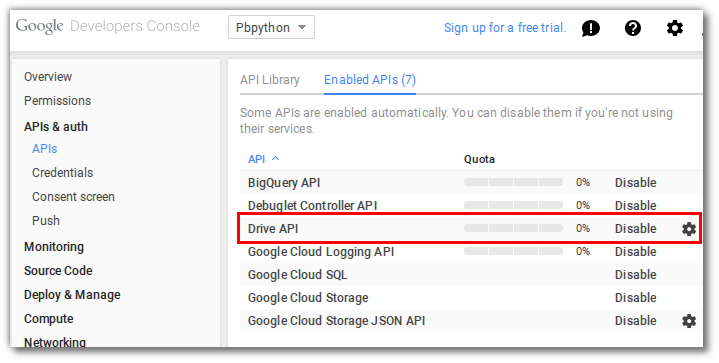 Google has many API’s available to you and the Developer’s Console allows you to selectively turn on and off the various API’s. For our purposes, the Drive API must be enabled. Once the API’s are enabled, you need to create your credentials. The Web Application would be useful if you were building a web app (shocking) and the user could interact with the site to enable access. The problem for our case is that this application will be run from the command line so it will not be a good fit for our solution. The Native Application ID looks like it might be useful but when you dive into it some more you will learn that it does not support the roles that we need; so it does not work. The Service account ID is meant to be used for these types of scripts so make sure you create one and select the JSON key. Then Create a client ID for the Service account. Make sure to select JSON key for the key type. Make sure to save the JSON key somewhere safe and not to check it into a public version control system! Keep track of the email address. You will need it in a bit. 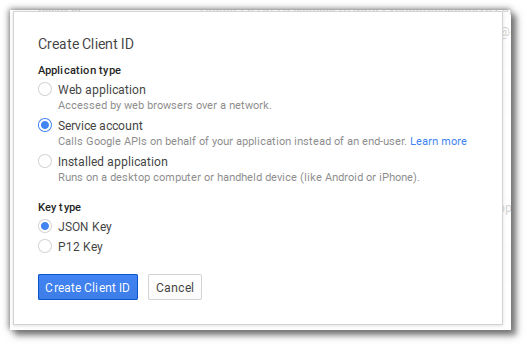 So now that you have your key, and have enabled your API, you need to allow the google sheet to be accessed by the user specified in the email address that was created for the service account. 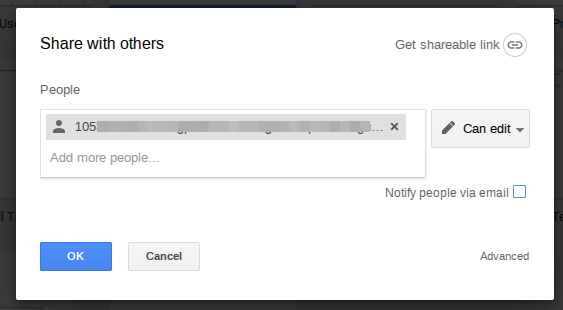 Go into your drive and enable sharing of that response sheet to the email you have listed. Go ahead and click ok. There is no one to send the invites to so you should be good. Ok. That’s a lot of initial setup work. However, I hope that the steps I’ve laid out are clear enough so that you won’t stumble through it as much as I did! We will use to two python libraries to make the authentication and data extraction simple. This library allows us to easily access, then read and write google sheets. The authentication documentation I show above is heavily based on the gspread docs. You should check them out to learn all about the options available to you with this app. We will only be using a very small portion for this exercise. OAuth 2 has multiple types of authentication methods. I won’t go into the differences between them but for the purposes of this script, we will used SignedJwtAssertionCredentials . Don’t worry if this doesn’t make sense right now. You’ll use it in a second. Now we will piece together the script. As you can see, I’ve imported the print_function to keep this python 2/3 compatible as well as the gspread module and SignedJwtAssertionCredentials as described above. I am also going to use the json module to read our secret file for the authentication handshake. As mentioned earlier, you are required to pass the SCOPE when authenticating so just know that this allows you to access and read a google sheet. The SECRETS_FILE is the name of the json file you downloaded from the google developer console. This script will assume that the file is in the same directory as your script. The SPREADSHEET variable is the name of the google sheet where the results are stored. It was a lot of work to get to these two lines of code but this is where the authentication magic happens. We take out the email, and private key, combine it with our scope and authenticate to google. If all works, google will give us some valid credentials. If you can not see any sheets here, make sure you have shared them to the correct email. Once we have the sheet, it only takes one line to read it into a DataFrame and use all the pandas power you are used to! After all that work, we’re now home free. Once you get the data into your dataframe, you can do whatever you would like. In the follow-on article, I will go through some more details but here are two simple steps that will make further manipulation easier. I know it has taken a while to get to the end of this article. While the steps may seem a bit daunting, once you do it once, it will be simple to do it again for future forms. Speaking of forms, here is the link to the survey please take a moment to fill it out. Having more data will make the survey that much more useful for the next article. Thank you for reading all the way to the end. I hope this is helpful to you and I look forward to reviewing the survey results with you.